This Dinosaur Bones craft is easy to make with our printable T-Rex dinosaur skeleton! The kids can pretend that they are on an archeological dig, a great craft for preschoolers on up! * Instructions for template: The template will open in a new window; close this window when you are done printing to return to the activity page. You will need Adobe Reader to open the template. If you do not have it you can download it for free here. 1. Print your skeleton on a piece of brown paper to make it look like the dinosaur bones are in the dirt. 2. 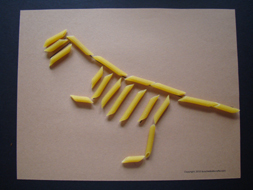 Glue the pasta on top of the lines to make your own dinosaur skeleton in the dirt! Although the penne looks more like real bones, another option for this craft is to break up the pasta in to smaller flatter pieces. Another option is to smear glue on your paper and sprinkle sand over top (shake off the excess) to add some real dirt (and texture) to your picture.